At Ontario Nature, the Nature Guardians program sows the seeds for a new crop of environmentalists. On a chilly spring morning, it takes a lot of imagination to picture a forest along this eastern fringe of the Greater Toronto Area. Acres of damp farmland stretch west and south, stubbled with stalks and desiccated cobs of cattle corn left from the passage of last autumn’s combine harvesters. Clods of earth poke out of puddles, and low areas are nothing but muddy swamp after a very wet April. But this field is a special space. Named for the late environmentalist, the Bob Hunter Memorial Park is a 200-hectare swath of what will become – with the help of a new generation of conservation activists – Canada’s next national park. Jim Robb, general manager of the Friends of the Rouge Watershed, stands on a rise as he explains the 35-year journey to this point, from the near-miss that would have put this field on a flight path to a major airport in Pickering, to a massive habitat restoration and amelioration project that balances wilderness and sustainable local farming. “Every year we bring out about 4,000 people to plant 60,000 native trees, shrubs and wildflowers,” he says. “Ten years ago, there were only three sycamore trees left in the Rouge. Now, there are probably 3,000.” Then he turns to watch this year’s crop of Nature Guardians – none of them born before 1990 – tromp toward him across the field. 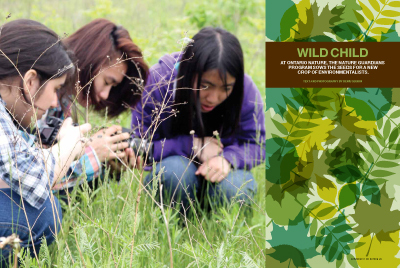 Launched in 2009 with a three-year grant from the Ontario Trillium Foundation, the Nature Guardians program connects kids with their wild side and with nature preservation activities. Part of that program is the vibrant Youth Council, which consists of 22 energetic and outgoing teens from across the province who organize volunteering opportunities in their communities; people like Stephanie Glanzmann – a well-spoken 16-year-old who is not sure yet what career she will choose but knows she wants to make a difference in the world. Not a moment too soon. There is a great need for the enthusiasm of people like Glanzmann. “Ontario’s naturalist community is greying and membership in nature clubs is in decline,” says Sarah Hedges, the Nature Guardians coordinator. “The clubs are worried for their future.” For some time, Ontario Nature has had a general outreach program – essentially an adult version of the Nature Guardians. But Hedges, who at 22 could be a Nature Guardian herself, says, “We decided to refocus our efforts on youth.” How young? Very. The program is aimed at kids five to 18, although university- aged students are also welcome. As little as five minutes spent in nature has been shown to improve mental health. Workplaces and schools that incorporate nature — even just by adding natural light — will experience fewer sick days and more efficiency. Studies suggest that interacting with nature can help children pay attention, motivate them to learn and improve both classroom behaviour and scores on standardized tests. Canadian children with a park playground within 1 kilometre of their homes were five times more likely to be of a healthy weight than children without a nearby park playground. The average Canadian child spends more than 40 hours/week (2,080 hours per year) in front of the TV and/or computer. Only 9 percent of boys and 4 percent of girls meet Health Canada’s recommended minimum of one hour a day of moderate-to-vigorous exercise. Of both sexes only 7 percent are getting the recommended amount of daily exercise. Outdoor play declines as children and youth age. Eighty percent of five- to 12-yearolds vs. 43 percent of 13- to 17-year-olds, play outdoors after school. Canadian children and youth spend 62 percent of their waking hours in sedentary pursuits, with six to eight hours per day of screen time as the average for school-aged kids. The seed for the Youth Council was planted at a youth summit for biodiversity held in June 2010. Sixty-five high school-aged Nature Guardians from across the province attended a weekend filled with workshops on a range of topics (“Slime and Scales”), seminars (“Boreal in Jeopardy”) and inspirational speeches (astronaut Roberta Bondar delivered the keynote address) guaranteed to stoke environmental fervour. The challenge was not so much to find the next generation of Jim Robbs, but to help young people find the Jim Robb within them. At the end, the conveners put a question to the group: Who among you would be interested in pursuing this process year-round? Thirty keeners raised their hands. In November 2010, a core group of 22 gathered at the Toronto Zoo, one of Ontario Nature’s partner organizations, for a leadership weekend. This colloquium was made of sterner stuff than the youth summit: the attendees heard about how to fundraise for their activities and organize a conservation event with volunteers. Worthy causes abound, but somebody has to order a bus, procure the tools, pack the snacks and get the people out. Conservation groups like Robb’s always need young volunteers, and one place that has them is the YMCA. Its Newcomer Youth Leadership Development Program encourages young immigrants to engage in their adopted community, while getting the 40-hour community service credit required for graduation from high school. Newcomer youth advisors Ashley Korn and Hanna Caplan are at the Rouge planting right along with their program participants. “We’re always looking for volunteer opportunities, and Ontario Nature has been setting stuff up,” says Korn. Ontario Nature has had a long and fruitful partnership with the Ontario Power Generation (OPG), one of our most generous supporters. OPG holds a deep commitment to promoting a healthy and vibrant landscape that supports wildlife and people. We share this vision for Ontario and have worked closely with OPG over the years to put that vision in action. This year, OPG generously provided Ontario Nature with a $50,000 sponsorship of our Nature Guardians program. Through this program, we will continue to foster leadership, raise awareness, and provide environmental education opportunities for young people, as well as engage the broader community through our many conservation events. Through the Nature Guardians program, OPG is making it possible for young people from diverse backgrounds to take on leadership roles and initiate restoration events in their own communities. 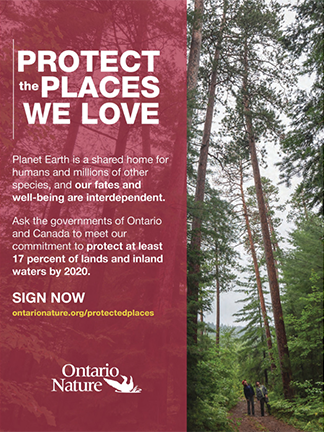 We are deeply grateful to OPG for their continued involvement in helping protect and restore biodiversity in Ontario not just today but far into the future. 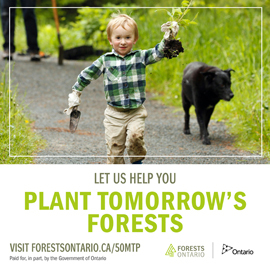 Note: The Nature Guardians program was started with funding from the Ontario Trillium Foundation in 2009. We are now in our third and final year of Trillium funding. In order to maintain this program, more sponsors like OPG or support from foundations and individuals, is urgently needed. Please contact Kimberley MacKenzie, director of development, if you would like to be a Nature Guardians sponsor.